What is the extent of hunger in Asia? Although Africa is frequently presented as the center of world hunger, Asia has always had more hungry people and more malnourished children, because Asia has so many more people. 64% of all malnourished children in the world live in Asia (FAO, 2017). 519.6 million adults and children in Asia consume too few calories, which accounts for about 12% of the total population of Asia (FAO, 2017). More than half of all stunted children under 5 lived in Asia in 2017 (UNICEF/WHO/World Bank Group, 2018). In 2017, Asia accounted for more than two thirds of all wasted children under 5 (UNICEF/WHO/World Bank Group, 2018). Southern Asia had the highest Global Hunger Index (GHI) score of 30.9, indicating serious levels of hunger (Global Hunger Index, 2017). Southern Asia has the highest rate (14.7%) of undernourishment and the most numbers of the hungry in Asia. 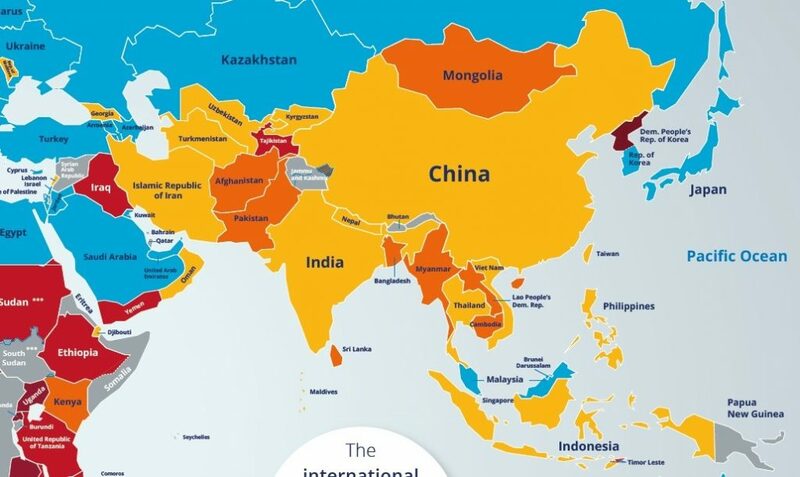 This region includes Afghanistan, Bangladesh, and India, among others (UNICEF/WHO/World Bank Group, 2018). In 2017, Southern Asia’s GHI score decreased 15.4 points from its 1992 score. India has made progress in decreasing its child stunting rate. Since 1992, child stunting rates have decreased by 23.5% (Global Hunger Index, 2017). India has a very large population size, so changes there have a strong influence on Southern Asia’s GHI score. To learn more about the differences between hunger and malnutrition, as well as the difference between over- and under-nutrition, see our related fact sheet on Hunger and Nutrition. Figure 1. Prevalence of undernourishment in the population (percent) in 2014-16. Source: Reproduced from FAO, IFAD, UNICEF, WFP and WHO. Stunting is the result of a biological process where children do not grow to reach their theoretical potential. It is recognized as one of the most significant impediments to human development and has long-lasting health and cognitive impacts. Stunting is the result of prolonged inadequate nutrition and repeated infection during the first two years of life. There are 150.8 million stunted children in the world. Approximately 83.6 million, or 55%, of stunted children live in Asia (UNICEF/WHO/World Bank Group, 2018). India has the largest number of stunted children in the world. It is estimated that 38%, or 46.8 million, of all the children in India are affected by stunting. This is about one-third of the global total of stunted children (UNICEF). On a positive note, child stunting rates in India have decreased by 23.5% since 1992 (Global Hunger Index, 2017). Wasting, defined as low weight for height, can be the result of famine or other severe food shortages. Wasted children often appear very thin and lack the energy to laugh and play. Stunting and wasting are very closely tied with other health indicators. Together, health and nutrition determine the growth trajectory of a child. A child with poor health will not have the same appetite as a healthy child. That child will not be able to absorb the same amount of nutrients from the food they do eat, because much of their bodily energy will be directed towards fighting off illness. Similarly, a malnourished child will be much more susceptible to disease, particularly if they have micronutrient deficiencies. In 2017, more than two-thirds of all wasted children under 5 years of age lived in Asia. This represents approximately 35 million children (UNCEF/WHO/World Bank Group, 2018). Wasting in Southern Asia is considered a critical public health emergency. More than half of all wasted children in the world live in Southern Asia. The highest prevalence of wasting in Asia is in India, at 26%; this is the highest rate in the world (FAO, 2017). Figure 3. 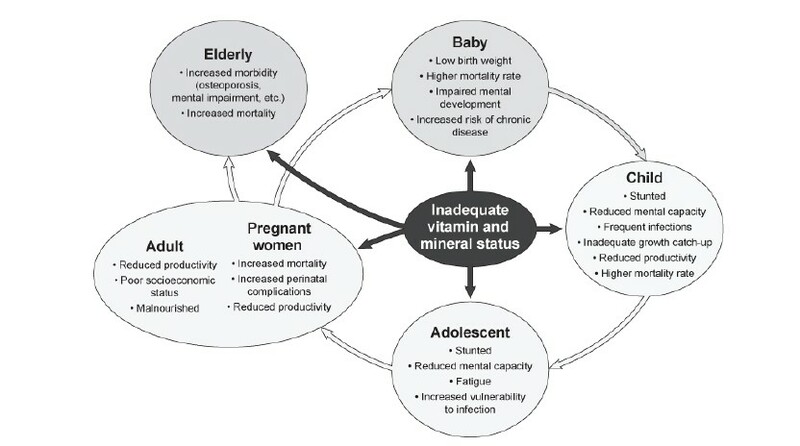 The cycle of micronutrient inadequacies across the life span. Reproduced from Bailey, R.L. et al. Micronutrient deficiencies are the result of inadequate amounts of essential vitamins and minerals in the diet. This is different from protein-energy malnutrition, which is the result of inadequate calories in the diet. Three of the most significant micronutrient deficiencies in the developing world are vitamin A deficiency, zinc deficiency, and iron deficiency (which is usually called anemia). All these deficiencies can be resolved through supplementation programs; in a number of Asian countries, they remain a public health risk (Source: WHO, UNICEF, and Food and Nutrition Bulletin, 2017). Vitamin A deficiency is associated with blindness, child mortality, and maternal mortality. In South Asia, 44-50% of preschool-aged children have severe vitamin A deficiency. In 2006, 30% of pregnant women in Pakistan were thought to be vitamin A deficient. In Pakistan, 9.4% of the population suffers from night blindness. In Pakistan, 60% of all deaths among children under the age of five could be attributed to health complications due to vitamin A deficiency. In India, nearly 62% of preschool-aged children are deficient in vitamin A. In Bangladesh, 51% of pregnant women consume a diet too low in Vitamin A, and 18.5% of pregnant women exhibit clinical symptoms of vitamin A deficiency (Akhtar, Ismail, Atukorala, Arlappa, 2013). Zinc deficiency is a major risk factor for morbidity and mortality. Nearly 800,000 deaths per year among children under five years of age are the result of zinc deficiency. Zinc deficiency increases mortality associated with infections. Zinc deficiency in early pregnancy has been associated with complications in pregnancy outcomes at later stages. The prevalence of zinc deficiency among preschool-aged children in five states in India was 44%, 50% among adolescent girls in Delhi, and 52% among non-pregnant women of central India (Akhtar et al., 2013). Anemia is a condition characterized by a lack of hemoglobin (iron-bearing molecules) in the bloodstream. Hemoglobin is necessary to carry oxygen to cells throughout the body. Anemia is often caused by an inadequate consumption of iron from the diet. Iron deficient anemia is known to slow brain development in children and is a key predictor of morbidity and mortality. In pregnancy, anemia can increase the risk of maternal and child mortality, complications during childbirth, and poor fetal development. In 2016, the prevalence of anemia among women of reproductive age in Asia was 36.6% (FAO, 2017). In India, a national health survey suggests that the prevalence of anemia in adolescent girls (15-19 yrs. ), is 56% (Kumari, Bharti, Raushan, Kalpana, Archana, Sudhir, Anand, Kumar, 2017). In Pakistan, Anemia affects 91% of pregnant women and 65% children under the age of five. In Bangladesh, 40% of adolescent girls were found to be anemic. Across South Asia, it is estimated that 25,000 women die in childbirth due in part to severe anemia (Akhtar et al., 2013). Poor and insufficient sanitation and hygiene practices, such as those found in many parts of Asia, can increase the spread of disease and infection. Lack of water, poor sanitation, and hygiene practices may cause up to 50% of all child malnourishment. Every year there are 2.5 billion cases of diarrhea in children under 5 – this causes key nutrients to be lost from the body. The risk of bacterial infection is increased due to the 523 million people in India defecating in the open (UNICEF). Across Asia, the availability of highly processed foods has increased drastically. These foods are high in calories, but low in nutrients, and may not be fortified. Consumption of these processed foods by adults and children has led to the rise of overnutrition, which is a cause of obesity. Traditional diet staples, such as hardy millets, contain large amounts of protein, fiber, and essential minerals. These staple grains have been replaced by processed rice and wheat flours, which are very low in vitamins and minerals but high in carbohydrates. This contributes both to a rise in overweight individuals, and a decline of protein consumption. In one household there may be both obese individuals and undernourished individuals, each with micronutrient deficiencies. This is known as “triple-burden” malnutrition and is a growing problem in Asia. In Asia, 17.5 million individuals are defined as being overweight, with the largest numbers found in Southern Asia (5.4 million) (UNCEF/WHO/World Bank Group, 2018). In several Asian countries, women do not have access to the same education, healthcare, or information technology as men. Women are often the primary care-takers of children, but they are inadequately informed about how to care for their own health and the nutrition needs of their children; they may also have little say in the economic activities of their household. Increased female education and empowerment has been shown to significantly improve child nutrition and child health outcomes (Pappachan, Binu, Choonara, 2017). In Asia, people living in rural environments are more likely to be malnourished than those in urban environments, especially children (International Institute for Population Sciences, 2017). In 2016, 31% of children (under age five) in India’s urban areas were stunted, while 41% of rural children were stunted. Additionally, 20% of children in urban areas were wasted, while 21.5% of rural children were wasted (International Institute for Population Sciences, 2017). Maternal education: It is more likely that an urban mother will have a secondary education and will have higher decision-making power in her household. Hygiene and sanitation: The urban household is more likely to have access to and use a flush toilet, as opposed to open defecation or a pit latrine. Economic status: Urban families also tend to have a better economic status than rural families (Srinivasan, Zanello, Shankar, 2013). Bailey, R.L., West, K.P., Jr., and Black, R.E. (2015). The epidemiology of global micronutrient deficiencies. Ann. Nutr. Metab., 66, 22–33. FAO, IFAD, UNICEF, WFP, and WHO. (2017). The State of Food Security and Nutrition in the World 2017. Building resilience for peace and food security. Rome, FAO. Retrieved from http://www.fao.org/3/a-I7695e.pdf. International Institute for Population Sciences (IIPS) and Macro International. (2017). National Family Health Survey (NFHS-3). Mumbai. Pappachan, Binu and Choonara, Imti. (2017). Inequalities in Child Health in India. BMJ Paediatr Open. 2017 Aug 4; 1 (1):e000054. Doi: 10.1136/bmjpo-2017-000054. eCollection. Srinivasan, C., Zanello, G., and Shankar B. (2013). Rural-urban disparities in child nutrition in Bangladesh and Nepal. BMC Public Health. 13:581. Doi: 10.1186/1471-2458-13-581. United Nations Children’s Fund (UNICEF), World Health Organization, International Bank for Reconstruction and Development/The World Bank. (2018). Levels and trends in child malnutrition: key findings of the 2018 Edition of the Joint Child Malnutrition Estimates. Geneva: World Health Organization. Von Grebmer, K., Bernstein, J., Hossain, N., Brown, T., Prasai, N., Yohannes, Y., Patterson, F., Sonntag, A., Zimmermann, S., Towey, O., and Foley, C. (2017). 2017 Global Hunger Index: The Inequalities of Hunger. Washington, DC: International Food Policy Research Institute; Bonn: Welthungerhilfe; and Dublin: Concern Worldwide.